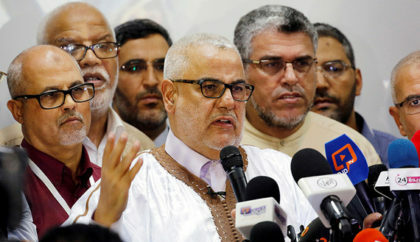 Stalemate is the word that describes the best the sterile negotiations over government formation in Morocco. Three months after the Islamist Justice and Development Party (PJD) won Morocco’s legislative elections with a narrow margin against its arch rival liberal Authenticity and Modernity Party (PAM), Morocco remains without a government. Abdelilah Benkirane, Secretary General of the PJD, appointed by the King Head of Government and tasked with forming the upcoming cabinet, issued on Sunday a statement setting the tone of an utter failure in reaching an agreement over the composition of the next governmental coalition, a situation that puts the country on the verge of a political crisis. Benkirane’s strong worded statement blames the President of the centre right party, the National Rally of Independents (RNI), Aziz Akhannouch, for the deadlock in negotiations. Benkirane ascribed the delay in forming the cabinet to the non-receipt of a response from Akhannouch, adding that the same thing applies to the Secretary General of the Popular Movement (MP). Benkirane’s statement came after the RNI together with the leftist USFP, liberal UC and MP expressed their wish to see negotiations expanded to involve other political parties, especially after the PJD called for a government made up of the same political coalition of the outgoing cabinet. The volte-face of Benkirane towards the RNI came after it broke an alliance with the Independence Party (PI). The RNI conditioned its participation in a PJD-led government with the exclusion of the PI, while the PJD insisted on the participation of the PI leading to a stalemate in negotiations. Two Royal Advisors , Abdellatif Mennouni and Omar Kabbaj met with Benkirane at the end of December and expressed to him the concern of the Sovereign regarding the delay in forming the new government. Soon after that, the PJD said that the PI will not be part of the next government in a bid to overcome the deadlock and forge ahead with negotiations. With 125 seats in Parliament, the PJD finds itself on an uphill battle to form a government in a stratified political landscape in which its arch rival the PAM has won 102 seats. The fragmentation of Morocco’s political landscape makes no party able to win an outright majority. To secure the majority of seats needed to form a government coalition, the PJD has at least to enter into a coalition with 4 parties, a task that may put the PJD on a rocky road to negotiate the distribution of ministerial portfolios and compromise on their party’s policy to bring it in tandem with its partners in the future government. The Moroccan constitution does not specify the measures to be taken in case the party that won most seats fails to form a government. Several scenarios are on the table including the intervention of the Monarchy as a supreme referee between the political parties by either interceding to convince the leader of the RNI, which came in 4th in the elections, and Benkirane to compromise or by designating a less controversial figure within the PJD to lead consultations.